Yesterday was my 3rd day in Sept that I started to focus in day-trading. Luxchem split on Wednesday ... so, it became a penny and active ... well, we all read about TKO's adding Luxchem into his portfolio. So, using that piece of news, I waited for the split and trade on it. It was hanging around 78-79 in the morning ...but then started to surge after lunch. I grabbed at market 80.5 ... and added up to 82cents. Parked to sell at 85cents, it was done!! Day-trading is difficult as we need EXPERIENCES and ... of coz some luck. 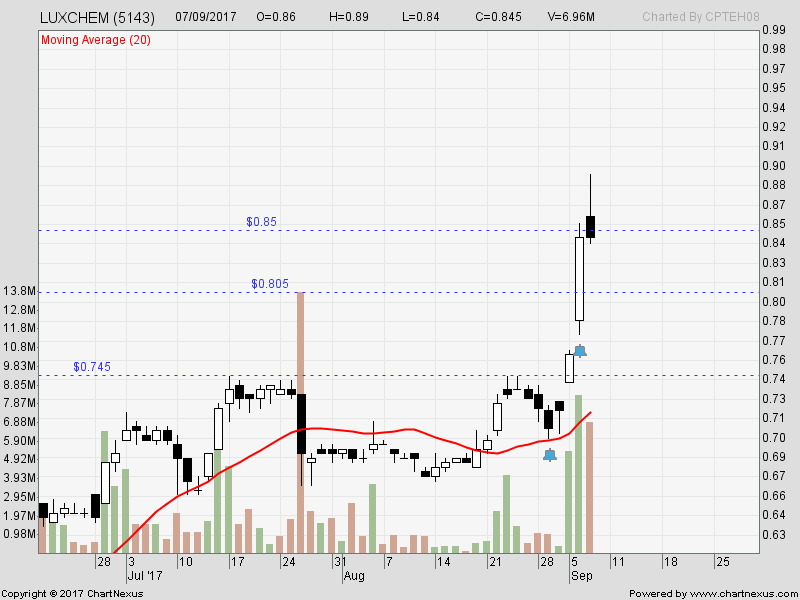 It cloed 84.5 but I didnt buyback. This is good and above my average profit-target. Yesterday, it gapped up to open at 86 cents ... and I queued to take it at 83 pullback, hit 84 and mine not done. Cancelled the queue and focus in others ...next!! Well, DOW down by 234 points a night before but unfortunately, KLSE no diving for me to go shopping. With North Korea fear clearing, it is time to be back to markets!! CAB : It was a 1.04-1.05, so I queue to buy 1.02 and 1.03. It came down and hit my 1.03 queue ... done. 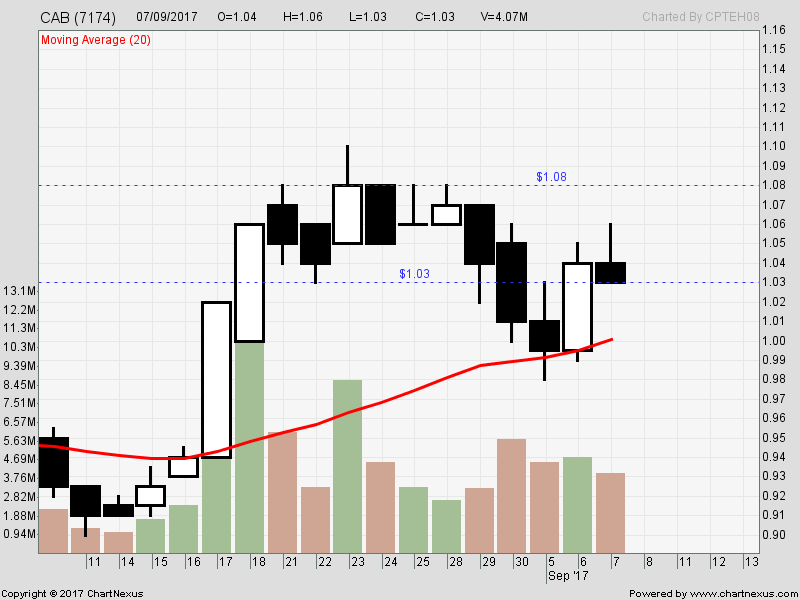 So, my target is 1.08 resistance but checking the momentum, it is not as strong ... and I have to queue 1.06 to sell. It hit 1.06 but mine not done. So, I soldit off at R1.05 for my day-trade profit. 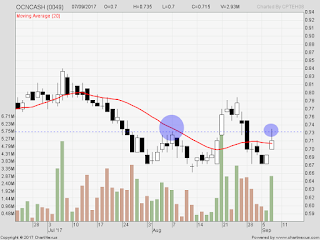 Slightly below my profit-target (for each trade, my aim is to earn RM200 - RM400). Well, still a profit. 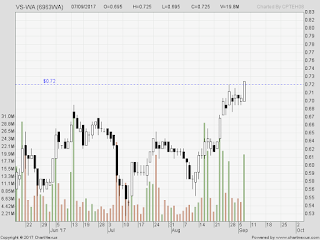 Bought this one in the opening 70cents as it gapped up and with volume. It was active dring opening but then ... cool off, resting at 70-70.5. 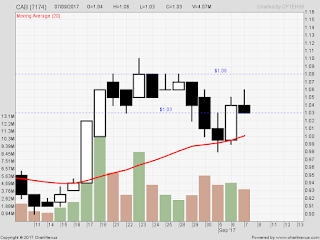 I queued another portion to buy at 69.5 but it never pullback. 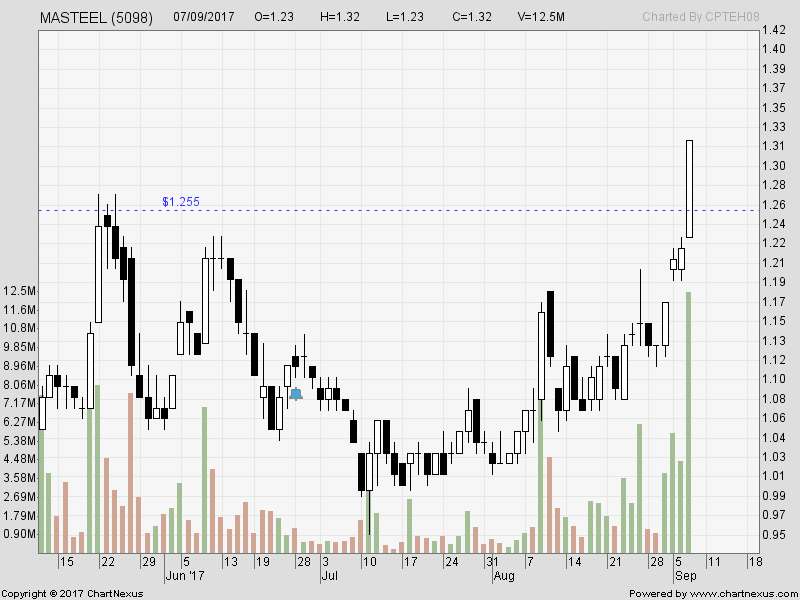 So, I queue to sell at 73cents resistance. I do not check on her ... after lunch, it surged and mine done!! Average profit target achieved. 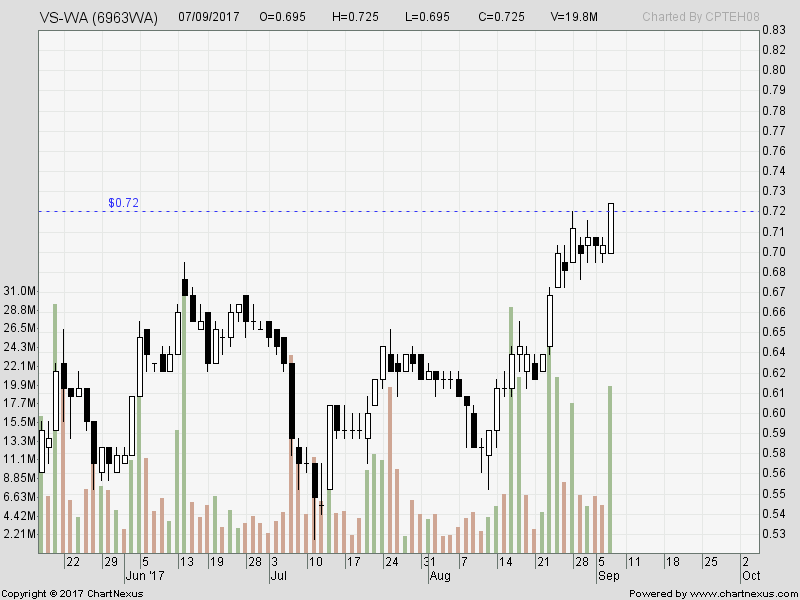 As we know ... some steel-counters in play ... and awaiting breakout. 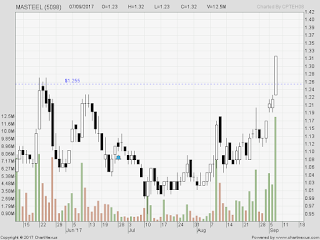 I grabbed market 1.27 breakout and q to buy 1.25 and 1.26. My 1.26 eventually done after some time bt due to strong momentum, it didnt look back ... I queued to sell at 1.30 for my profit-target ... and have to wait till after 4pm ... it went to clear 1.30, and closed a good white-candle at 1.32. Being a day-trader, we exit our position .. unless I have larger positions done, andif a good candle-stick formed during closing ... I may want to sell half, and keep half for the next day!! This is what I done for my next trade!! 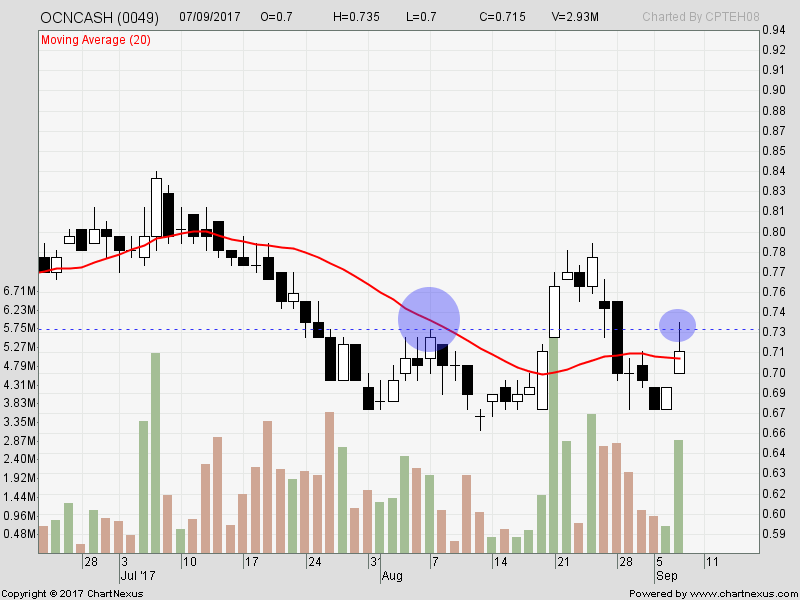 VS-wa : I bought 70.5cents market in the morning, and then 70cents done too. I m surprised that 69.5 cents queue was taken too. Done. It was not moving as mommy VS at 2.37 level ... and hitting 2.39. Then, mommy starts to move aheadof 2.40 resistance ... and hit 2.41 ... andVS-wa starts to move too. After lunch, it hit my 71cents target. Done. 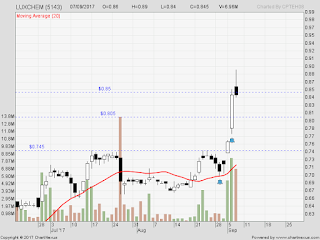 But seeing the momentum, I bought bac at 71 and 71.5 ... only to sell half at closing price 72.5. Holding on to the other half for today ... to fight again the next day, as traders. haha. So for ... in 3 days, I have done more than 6 trades ... the others not done yet. Once done ... win or lose, I will post it here. Every trades done is shared 'live' in my closed-group. Have a nice trading day ... for me it is day #4 . Need to have breakfast and prepare for my trades.